Took Younger Brother to his post-surgery check-up yesterday. Told the plastic surgeon about the whole dietitian appointment weirdness; he agreed that it was weird and said he’d look into it. I heard him talking to someone about it on the way out. Highly anticlimactic, but anticlimactic is a good thing when you’re talking about your baby’s health. YB’s awesome zig-zag scar is healing nicely and his head’s doing great overall. And we don’t have to go back to the disorganized clinic for another four months. The more emotional experience of the day happened on the way home. I stopped by a local thrift store and dropped off a big box of outgrown baby clothes. I’m pretty nostalgic about stuff, so it hurt my heart a bit to drive away and leave that box behind. I said goodbye to my office yesterday. Literally: I closed the door for a minute, so no one could see, and gave each remaining item a small farewell. Goodbye, chair. You have been a good and comfortable chair. Goodbye, computer. Thanks for holding up as long as you did. Goodbye, desk. May you last forever. I moved into that office three years ago, about a week before Little Boy was born, so it seemed fitting that I would be very pregnant again while moving out. The furniture had come with me from my first office, a larger shared space in the main building. That office switch had been quite the kerfuffle, the product of some rather poor decisions by our department chair, but it had worked out in the end. After my little parting ritual, I turned all my keys into the department office, one of the last steps to being done. I submitted the final version of my dissertation to the appropriate authorities last week. My campus parking permit expired on Friday; my student health insurance ends at midnight tonight. It’ll be another week before my transcript says I’ve finished, and then goodness knows how long before they mail out the actual diploma, but at this point, I’m not a PhD student any more. I have a PhD. Goodbyes to furniture are melancholic but easy. Goodbyes to people are much harder, especially when you’re trying to communicate how important someone has been in your life. I ended as awkward as ever, and spent the next few hours at home trying to recover from the panicky anxiety that ensued. Watching the new grad students register for classes and the established ones settling in for another year, I also got the feeling that the department was moving on without me—which of course it is, because that’s how universities work. I won’t miss academia, but I will miss this place, if only because it was a part of my life for so long. I’ll miss my friends, many of whom have already gone off to various jobs in other states. I’ll miss, for a short bit anyway, the part of my identity that revolved around being a student. As a parent, I’ve become much more vigilant about carrying my phone around with me, even into meetings and places where I can’t easily step out to take a call. Thank goodness for caller ID, is all I can say. In practice, my “should I answer it?” thought process has a few more qualifications than the above chart, although not many. Which of my contacts is calling is relevant. For instance, if I got a call from my brother, I would drop whatever I was doing to answer it, because my brother has literally not called me since the year 2010 and I can’t imagine what would prompt him to do it now. (We communicate by text.) And yes, I do have Little Boy’s daycare in my contacts, but only their main line; the teachers usually call from the classroom phones and I don’t have those all saved. Also, when I say local number, I mean local as in “where I live,” not local as in “same area code as me.” Like many folks my age, I’ve moved since I was first assigned this number, and no one who’s not already in my contact list is going to be calling me from my original area code. I still get mystery calls from that region, though. They never leave a message, so they’re either genuine wrong numbers or scammers trying to spoof a number they think I’ll pick up. On rare occasions, I still get calls for the guy who had this number before me, even though I’ve had it for more than a decade. Usually, it’s just automated spam with his name inserted, but once it was a real person. A collection agency, I think. I assured the lady on the other end that I had no idea where the guy was or how to contact him, and she never called back. 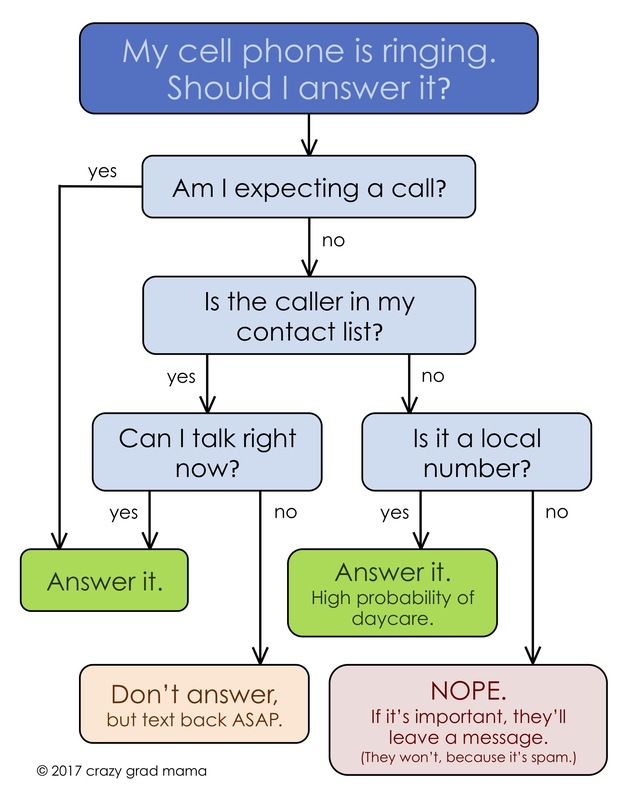 How do you decide whether or not to answer the phone? Whenever I go for a while without blogging, I get into a negative feedback loop about it. It’s been a while, so my next post needs to be something Big and Important. I don’t have the time/energy to write any Big and Important posts right now. So this post is a deliberately short note to break the cycle. I’m almost halfway through this pregnancy. The baby is healthy, so far as I can tell; he or she is a strong kicker. I’m healthy by the numbers, but ridiculously fatigued, which is pretty much the story of my adult life in one sentence. Little Boy’s two-year-old cuteness deserves its own post. The Terrible Twos get a bad rap, I think. He can be plenty obnoxious sometimes (and has an inexhaustible supply of bouncy energy), but he’s also smart and thoughtful and independent and deeply engaged with his world. It’s hard to feel thankful right now, when my worldview is so cynical and depressed and afraid, but it’s Thanksgiving and I thought it might help to try. I’m thankful for a healthy child, who’s learning to string words into sentences. Who dances with me, and who takes the job of putting dirty clothes in the hamper very seriously. I’m thankful for my husband, who is there to hold me when I cry and who makes the best green bean casserole in America. Who insists that he isn’t brave, but is. I’m thankful for my parents—thankful that they are alive and well, thankful that we figure each other out a little more each year, and thankful that they took the news of their son-in-law’s gender identity with grace and love. I’m thankful for the quiet peace of the sunrise on my run this morning. I’m thankful for my legs and my lungs that let me run, even if they sometimes falter. I’m thankful for the way the winter sun shines bright on my face when I’m at the kitchen sink. I’m thankful for iTunes, for portable music players, and for the aux cable in my car. I’m thankful for this house, for its space and its light, for the park across the street, and for our generally wonderful landlords. I’m thankful that I’ve got another paper under review at a journal, bringing me one step closer to finishing my PhD. I’m thankful for the friends I’ve made over the years, who pop up to check on me when I least expect it. I’m thankful for the folks I only know online, for smart conversations and shared righteous anger and links to all kinds of new and interesting things. I’m thankful for cups of tea and glasses of wine. I’m thankful for all the superhero shows on the CW, because they bring me laughter and hope. I’m thankful that I get to spend this year’s Thanksgiving in a T-shirt and sweatpants, with no stress and no small talk. I’m thankful that I don’t have to worry about the money for little things, at least for now. I guess maybe I feel thankful after all. When I first started this blog, I was eager to post as often as I could. I had Things To Say and finally an outlet to say them. I’m still working on my PhD, but I’m no longer utterly unsure about how to proceed. I’ve made a decision, and so at least for the next year, I have a plan. I’m learning to Say Things in real life, and to only pursue the approval of people who are really my friends, and stop wasting effort on those who are not. All of which is to say: this blog has been a really important part of figuring out my life, but maybe—just maybe—I need it a little bit less right now. Or maybe it’s that my mind is in a different place, and needs a different kind of therapy. Maybe I’m just busy, and tired, and lacking inspiration. Whatever the cause, the result is that I’ve found myself wanting to blog less and less. I’ve been self-conscious about it, because even though this blog has always been first and foremost for myself, I like having readers and visitors and commenters, and a little part of me feels like I’m letting you folks down. I felt you deserved an explanation. I hope you’ll continue to check back in once in a while. Thanks for reading. Today should’ve been a long run day. “Long” is a relative term, of course, but we’re talking 4 or 5 miles, slow but steady. Instead, I shuffled through a little over 2. This isn’t the first time I’ve cut my long run recently, but it was the first time I did so without being actively sick. It became increasingly clear over the last month that maintaining all five together was unsustainable, because #4 kept breaking down. Something had to give, and my physical health is what did. I have to back off somewhere else, it seems, while my immune system recuperates and my body gathers its strength. #1 is inescapable, and I can’t cut back on #2 if I hope to graduate. #5 underlies all the rest and has to take priority. That leaves #3, running. Thus, temporarily, I’m cutting way back. It’s a bit tricky mentally—running is wrapped up in my lingering body image issues—but I’m hoping the benefits of rest will make up for that. I’ll reassess in a few weeks. Anyone else in a similar position? Objectively, I’m not actually that old, but I’m feeling it in a way that I haven’t before. I’m closer to 30 than 20, still young but not the youngest anymore. Maybe I’m hitting that heretofore-mythical stage when one starts feeling like an adult. It’s a confluence of factors, I think. The changing of the seasons, heading into yet another summer at the end of yet another year of grad school. The eternity of the same routine, when a whole class of college students has been and gone and graduated in the time I’ve been here. And speaking of that mom thing, my kid is almost two. Where does the time go? Time is forcing me to change the vision I have of myself in my head. It’s hard, and I am tired. Little Boy and I went for a drive this morning. We were headed to the library that has Friday storytime, except it turned out that we were too early, so I kept driving to kill some time. Eventually the road we were on led us to an area of new construction, where roofs were being finished and driveways were being laid for gorgeous (if somewhat closely spaced) suburban homes. As I made a U-turn in front of what would eventually be the clubhouse for a fancy HOA, I thought, Gosh, I bet anyone who sees us thinks we’re real weirdos for meandering aimlessly out here. And then I realized: here I was, a white lady with a young family driving a shiny new crossover SUV in the suburbs on a weekday morning. I am exactly the target demographic for these houses. Anyone out there probably assumed I was scouting out a new home for my family. P.S. We then went to storytime and all the parents were white moms and I felt like it was one of the most stereotypical things I’ve ever done but Little Boy had a good time and it got us both out of the house.